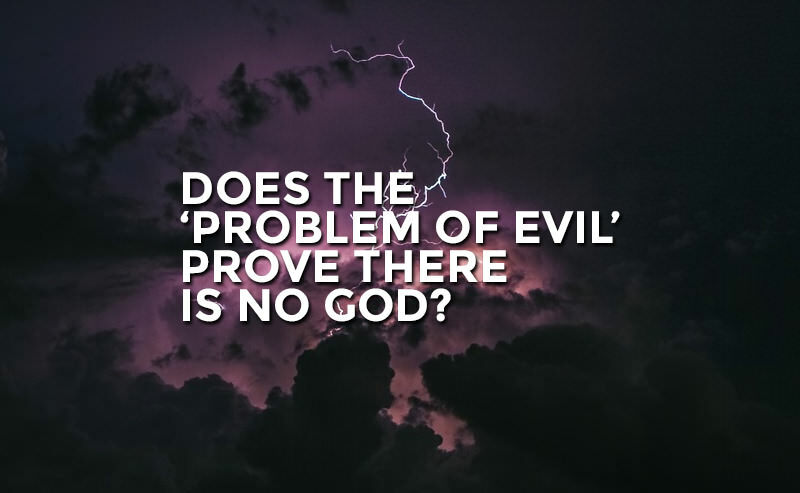 Blog Does ‘The Problem Of Evil’ Prove There Is No God? About this time in 2008, I set out to find a solution to the problem of evil. In particular, I wanted a solution that fit well with the Bible’s emphatic, resounding declaration that everything exists for the glory of God. It almost sounds ridiculous—perhaps a bit pretentious and assuming. I was 22. But it worked. I got to my destination, six months later. I got there simply by reading—reading anything and everything I could find by the very best scholars. What I discovered was this: there are very simple and very good answers to the problem of evil. At first glance, it may seem like the existence of evil is inconsistent with the existence of an all knowing, all powerful and perfectly good God. A God like that would want to eliminate evil, would be able to eliminate evil, and yet there is still evil. So, many scholars have attempted to argue, that God must not exist. But parents allow suffering in the lives of their children all the time, and they exist. So why can’t God do the same? Parents allow the suffering of yard work, homework, rigorous training for sports, time-outs, and a million other things. But they allow all that suffering because they know that their children will be better for it. They have good reasons for allowing it. So why assume that God doesn’t have good reasons? Philosophically, it works like this: if it is even possible that God could have a good reason for allowing evil, then the problem of evil fails. It does not disprove the existence of God. Logically, this answer works very well. And after embarking on a second journey this last summer to dig deeper into the problem of evil, I found that the answers were even better than I originally thought. It is really this simple: why does God allow evil? Answer: because he knows that, if he allows evil, the universe will be better for it in the end. Although it really is that simple, I thought it would be a good idea to record a short list of the five best answers to the problem of evil. Most of my academic research has been devoted to this topic (both my journeys turned into master’s theses), and I’ve noticed that there is a fair amount of solid work but a few points of shining brilliance. In my opinion, this is the brilliance. I first heard this one from Tim Keller and I love it because it points directly to the gospel. It can’t be because he doesn’t love us because we know that he sent Jesus to save us from the consequences of evil. Imagine yourself in God’s situation: you’ve created a world and it’s gone terribly wrong; there is suffering, sadness, and dying. What more could you possibly do than enter into that world yourself and die a horrible death to save it from evil and suffering? What more could anyone ask of God? Nothing more. In some instances of tragedy, we come to see—perhaps years down the road—why that event occurred. I might see, for example, that getting in that car accident led to meeting my spouse (didn’t actually happen, but it could have!). In other instances of tragedy, however, it is hard to see how the evil is made right or even could be made right. Yet if we can’t tell how some evil was redeemed, that doesn’t mean that it wasn’t actually redeemed. Perhaps we just don’t have the capacity to understand its redemption? Maybe it’s beyond our ken. Maybe it’s too complicated. Maybe it is not yet redeemed, but will be soon or sometime in the future. So why does God allow evil? Because he doesn’t want a world full of robots. The overall state of affairs in the universe will be, all things considered, better because God made free creatures who could choose to do wrong or right but often chose to do wrong. In other words, God looked at the universe and knew that it would be much better off if people had real, morally significant freedom. He knew the cost would be immense suffering, and yet, he chose not to stop it because he knew that it would be worth it in the end. Imagine what would happen if God didn’t allow natural evil? Would people really believe that God’s creation had gone wrong and needed to be redeemed? It might be far more difficult to convince people of the need for redemption if they lived in a perfect world. Moreover, there is nothing inherently wrong with hurricanes, earthquakes, volcanoes, tsunamis, etc. They only become wrong when they kill people (and perhaps animals, too). They are part of the natural order of things. They are necessary for the earth to function properly as a whole system. And I think this is the best reason: if God were to continually step in to prevent natural disasters and other things from hurting people, there would be no possibility of science. God would have to continually violate natural laws in order to prevent suffering, but doing so would eliminate the regularity in nature that makes science possible. Science needs regularity. Without regularity and without science, we wouldn’t have the life saving and life enhancing technology that we do today. In the end, it will have been worth it. God works all things together for the good, and a million years into eternity we will perhaps be able to see the forest instead of just trees. It may not be possible to prove this point. We might have to wait and see. But the whole point is that it is also not possible to disprove this point. Thus, the problem of evil cannot effectively disprove Christianity. God can exist and so can evil. • I chose these particular responses to the problem of evil because they (aside from the first response) are the best philosophical responses to the philosophical arguments from evil. That is to say, that if someone is trying to argue that Christianity (or theism) is not true, these responses will be the most effective in defending against their arguments. After reading hundreds of articles and books on the topic, I am convinced that these arguments are the very best for this purpose. • But of course there are other responses to the problem of evil that serve other purposes much better than the particular responses I listed. Some may want to know how to respond to friends or loved ones who have experienced some devastating tragedy. These replies are not meant to serve that purpose (except for #1). • Each one of these five points could easily be expanded into a book or many books. I have a faint feeling of guilt for my brevity. These arguments are so good and important, and there is so much to be said regarding each one and all the possible counterarguments, that it almost feels wrong to summarize them so briefly. But it’s a blog. What must be done has been done.